We’re nearing the end of our e-mail-cleanup challenge. So far, you’ve reduced the volume of incoming mail, created a filing system, and started using a simple process to deal with the new messages you receive. But what about all those messages still in your inbox? It’s time to take care of them now. If you’ve set up rules to process incoming mail, you can apply those same rules to the existing messages in your inbox. You may be surprised at how many old messages those rules will file away for you in a flash. First, go to your inbox and choose Edit: Select All. Then, in Mail, choose Message: Apply Rules. In Entourage, choose Message: Apply Rules: All Rules. Of the remaining messages, the older ones are less likely to require your active attention than the newer ones. Click on the Date Received or Date Sent column in your inbox to sort the messages by date, and skim over them beginning with the oldest ones. But be realistic. If a message has been in your inbox for more than a month without a response from you, the sender has probably forgotten about it. You can save yourself some time by moving all of these ancient e-mails into Filed (deleting truly unnecessary messages along the way). I want to reiterate that the intention here is not simply to move the problem (unprocessed e-mail) from one mailbox to another. The point is to be practical about how much time and attention you have to give. Filed will be the default destination of most messages; only the most crucial ones will turn into to-do items or move into Action for a reply. Although you should spend no longer than a minute or two on any single message, that time can still add up. So feel free to do this pruning in batches—an hour or two per day—until you’re down to an empty inbox. When you’re done cleaning out your inbox, you may have moved quite a few messages into the Action mailbox. Scan it daily; make it your goal to have fewer messages in your Action mailbox at the end of each day than at the beginning. Even when your older messages are safely out of your inbox, they’ll still show up in searches and when you look in your secondary mailboxes. Merely having those messages there can be distracting, and in some cases they can make it harder for you to find the more recent (and more relevant) messages you may be looking for. To get old messages out of your way, consider archiving them in such a way that you can still retrieve them if necessary. In Mail 3, you create an archive by selecting one or more mailboxes and choosing Mailbox: Archive Mailbox. In the dialog box that appears, navigate to the folder where you want to store the archived messages, and then click on Choose. Mail stores archived mailboxes in the .mbox format. Entourage doesn’t have an Archive command, but you can drag any mailbox to your desktop (or to another folder) to export it in the .mbox format. After archiving a mailbox, you can delete it (or at least the messages it contains). 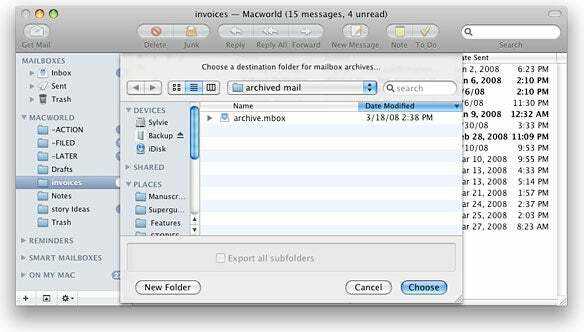 Mail lets you archive a mailbox in the .mbox format to get ancient messages out of your way. You can’t do much with .mbox files directly (though you can open them in a text editor if necessary). If you need to access the messages in an archive, you must reimport them into Mail or Entourage. (In Mail, choose File: Import Mailboxes, select Mbox Files, navigate to the folder containing the .mbox file, and click on Choose. Select the mailboxes you want to import and click on Continue. In Entourage, choose File: Import, select Contacts Or Messages From A Text File, and click on the right arrow. In the next dialog box, select Import Messages From An MBOX-Format Text File, and click on the right arrow. Navigate to the .mbox file, and click on Finish when you’re done. An even better option is to use a stand-alone e-mail archiving program such as Jon Seward’s $50 MailSteward to store and access your old messages. MailSteward can import .mbox files from any e-mail client, or can import messages from Mail without requiring that you archive them first. Within MailSteward, you can search your archives, and print or even reply to archived messages. Getting your inbox to a perpetually empty state may take time. You may not succeed immediately, and you may find that after a while you slip back into old habits. But it’s never too late to go back and follow these steps again. Of course, I am not the first person to realize the importance of keeping your inbox empty or to generate suggestions for making that a reality. I’ve benefited from the helpful advice of numerous productivity gurus. If you want further advice, consider consulting the masters. 43 Folders Merlin Mann provides numerous suggestions on emptying your inbox—and keeping it empty—in his Inbox Zero series of articles on the 43 Folders Web site. Read these, along with the reader-supplied comments, for further inspiration. GTD David Allen’s Getting Things Done method isn’t just for e-mail; it’s a complete plan for managing all the tasks in your work and personal life without becoming overwhelmed.